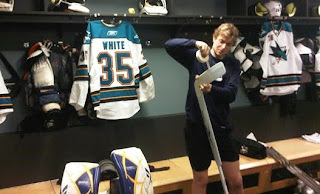 Tonight, Surrey native Jordan White will be on the bench of the San Jose Sharks play the Canucks at Rogers Arena, after Sharks netminder Anterro Nittymaki was hurt during the team’s morning skate. "I can be a Canucks fan every other night but [tonight] I'm going to rooting for the guys on the bench with me," said White. White has an .870 save percentage in the equivalent of about 15 games with UBC this year, and similar numbers last year, though UBC is, by one measure, one of the worst CIS teams in the country so don't read too much into that. But it doesn't much matter how good he is, to be frank, because the Sharks just need someone within driving distance who knows his blocker from his trapper. (The most recent such example of a goalie, any goalie, without pro experience nearby was Tom Fenton, who was signed by the Coyotes for one game in New York in December.) San Jose can't really call someone up from their AHL affiliate: Worcester played at home on the East Coast last night, and play tomorrow in Maine. Maine is kind of far away. Would you be a bad person if you cheered for an Antti Niemi injury tonight, just out of sheer curiosity? Yes. Yes, you would be. Ha! Anyone remember when UBC's Chris Levesque suited up for the Canucks in 2003? He almost got in net when Hedberg got injured, but unfortunately for Levesque, Hedberg shook it off. Well looks like he made a few bucks to go along with the thrill of a lifetime.